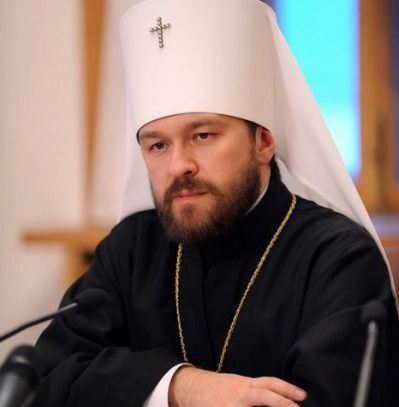 The Jesus portal has published a commentary of Metropolitan Hilarion of Volokolamsk, head of the Moscow Patriarchate Department for External Church Relations, on the attitudes prevalent on Holy Mount Athos ard to Constantinople’s creation of ‘a new church’ in Ukraine. There is a contradictory information coming from Mt. Athos. On the one hand, we have seen how two Athonite abbots came to Kiev for the ‘enthronement’ of a new head of the schism legalized by Constantinople, with Father Xenophon attending the event while the abbot of the Vatopedi monastery fell ill but managed to take a picture with the leaders of the schismatics. On the other hand, we can hear how the delegation of the Ukrainian schismatic structure was not let in the St. Panteleimon monastery while, after the visit of this delegation, seven monks have left the Vatopedi. Evidently, the legalization of the Ukrainian schism by Patriarch Bartholomew has caused new divisions: one of them is being formed before our eyes in the very heart of the Patriarchate of Constantinople – on Holy Mount Athos. Throughout centuries Athos has stood guard over the church truth and canonical order. And now it has to make a choice: to continue its ages-old vigil for the canonical truth or to obey the lawless decision of the Patriarch of Constantinople. This choice is to be made by Athonite monastic brotherhood as a whole and each monastery in particular. The Athonites know Metropolitan Onufry of Kiev and All Ukraine very well. Until recently, he was their frequent guest. Once, having come to Athos, I could hardly recognize him in the monks’ midst, as he stood modestly, wearing an ordinary black monastic klobuk sawn in the Greek fashion and wearing no pectoral icon. And many other hierarchs of the canonical Ukrainian Orthodox Church used to come to Athos on a regular basis. And now Patriarch Bartholomew has declared their Church non-existent. We all love Athos and used to come to it with joy until it was possible. But we love Athos not for its antiquity or architecture or beautiful landscapes, but, first of all, for the fact that Athos remains important as a pillar of the church truth for millions of Orthodox believers, for the feat of prayer for peace that the Athonite monks are performing, for the striking spiritual tranquillity with which everyone who comes to the Holy Mount comes in touch. The spiritual atmosphere of Athos is unique. It has been created by the efforts of many generations of the religious. And many Athonite monks are right to fear that it may be destroyed if Athos becomes open to women, as European politicians have repeatedly proposed it. But isn’t communion with the schismatics fraught with even more dangers for the whole order of monastic life? Will not Athos turn into the salt which has lost its savour (Mt. 5:13), if the troubled waters of the schism flood this holy place? I sincerely hope that in this situation, which has been suddenly dumped on it, Athos will make the only right choice – the one in favour of canonical order. And I thank all the Athonite monks and abbots who have already made this choice.